Tinsmiths’ Roman Blinds can be made in most cotton or linen fabrics; we use a blackout, thermal interlining as standard to give a firm, crisp blind with all the added benefits of thermal gain and light exclusion that this inter-lining provides. The visible lining is of a conventional ivory cotton into which rod pockets have been sewn, thence avoiding any stitching on the front of the blind. Roman Blinds can be fitted on the inside or outside of a window recess: those fitted on the inside of the recess give a neat resolution, are best for light exclusion (important for bedroom blinds) and are generally more straight forward to fit. 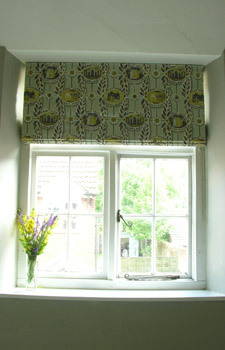 Roman blinds fitted outside the recess can be mounted up to 5 inches above the window, so that, when raised, they allow most of the available light to enter the room. BS EN 31320 came into force on 1st March 2014. To meet these new safety regulations Tinsmiths blinds are supplied with breakaway connectors at the bottom of each cord where it joins the bottom bar. Blinds are also supplied with a safety device to hold the beaded control mechanism; if this is fitted according to the accompanying instructions, blinds meet the requirements of BS EN 31320. If your blind pre-dates these and wish to upgrade it according to the new regulations we are very happy to help, please contact us. Take several width measurements and supply the narrowest minus 1cm. Measure the length of the blind without any deductions. Lastly take a measurement from the top of the blind to the floor. Width Measurement, measure at the top, middle & bottom, (old properties in particular can be rather variable!) 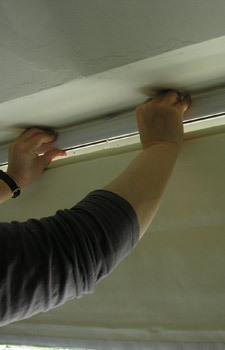 take the smallest measurement of the three and then deduct 1 cm so that there is a little bit of clearance space for the blind to happily pull up and down without snagging; this measurement is the finished blind width. Length Measurement measure the recess from top to bottom, do not deduct anything, this measurement is the finished blind length. 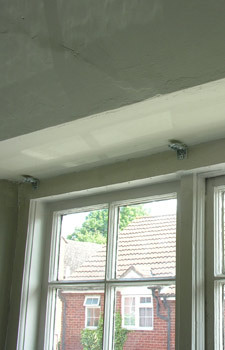 As a guide, for a width measurement, measure the window of sill. For length, measure the length of the recess and add 10-15cm. Lastly measure the length from the top of the blind to the floor. Roman blinds may be positioned outside of the recess of the window in order not to diminish the amount of light coming into the room. 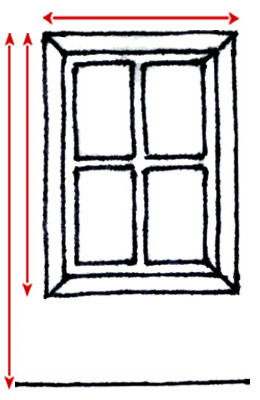 Length Measurement: We recommend that the top of the blind be set 10-15cm above the window and that a further 5cm is added to the length ie. below the sill. How far above the top of the window is a matter of personal preference as this alters the proportions of the window space and depends on space available. 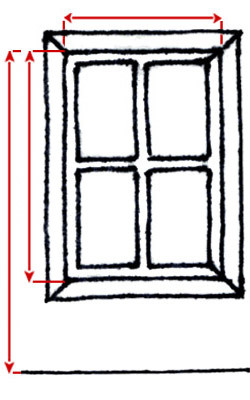 Width Measurement: We suggest that the width of the blind is the same width as the window sill. Again, this is a matter of personal preference and depends on space available. To Floor Measurement from this measurement we will calculate the length of beaded control you require to conform with the latest safety standard BS EN 13120. Young children can strangle in the loop of pull cords and chains that operate window coverings. New safety regulations BS EN13120 apply from 28th February 2014; please read and follow the instructions provided with your blind and use the safety equipment supplied. If you have any questions, please contact us. 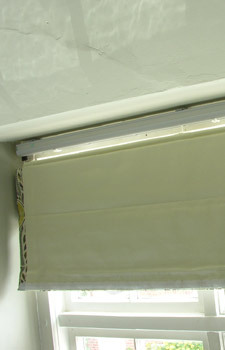 directed in the fitting instructions also supplied with the blind. 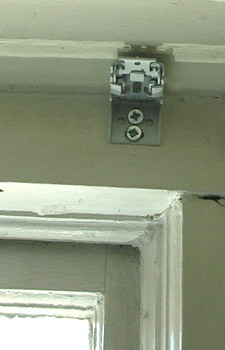 Screw the brackets onto a suitable surface at the top of the window. Check that they are evenly spaced and level with one another. Peel back the first fold to reveal the mechanism. Offer up the lower edge to the brackets and rotate the whole system to the upright position – you will feel it click in place. 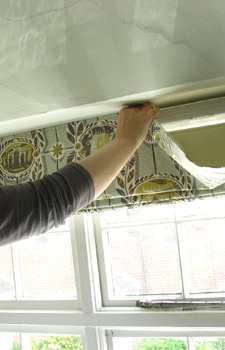 Check for a firm fix, with beaded control hanging neatly to one side. Now that the blind is in place, fit the safety device. This is to protect pets and children from getting tangled up in the metal beaded chain. Blinds are supplied with equipment compliant with BS EN 13120. To comply, and be safe for children, the accompanying safety device must be fitted according to the card instructions provided. 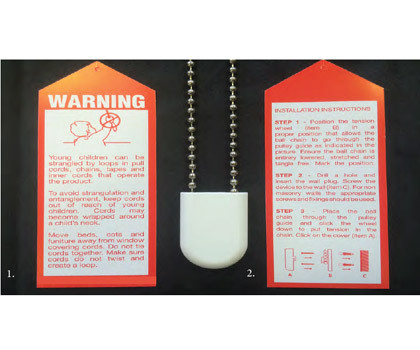 The safety device must hold the ball chain stretched and tangle free no less than 150cm from the floor. There are no exemptions for domestic use. Thank you for interpreting our ideas for a bed canopy: your help and advice was invaluable. It has been much admired by all our guests.